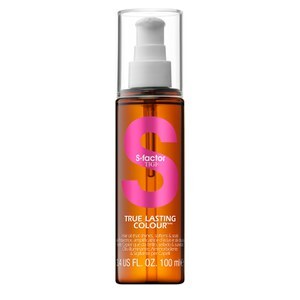 TIGI S-Factor True Lasting Colour Hair Oil is a non-greasy spray to add shimmer and shine to your locks. The versatile oil can be used as a styling oil to protect against heat damage or as a finishing product to set your desired hair style and enhance colour vibrancy. Experience frizz-free locks that are smoother and silkier, without those unwanted flyaways. E.N. Apply to wet hair and twist through the mid-lengths to ends. Or use as a finishing spray to tame flyaways.